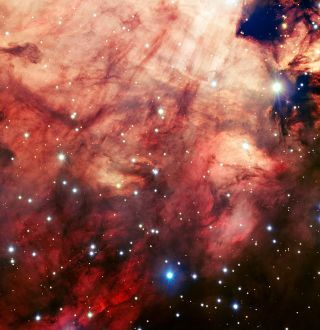 This image of the Omega Nebula (Messier 17), captured by the European Southern Observatory's Very Large Telescope, is one of the sharpest of this object ever taken from the ground. It shows the dusty, rosy central parts of the famous star-forming region in fine detail. The spectacular pink and red core of a lively nebula takes center stage in a new photo that exposes the stellar nursery's eye-catching clouds of gas, dust and newborn stars. The European Southern Observatory's Very Large Telescope (VLT), at the Paranal Observatory in Chile, captured the new image of the Omega Nebula. The portrait is one of the sharpest ever taken of this object from a ground-based observatory, according to ESO officials. This stellar breeding ground lies approximately 6,500 light-years away from Earth, in the direction of the constellation of Sagittarius (The Archer). The Omega nebula is a popular target of study for astronomers because it is one of the youngest and most active stellar nurseries for massive stars in the Milky Way galaxy. The nebula has several different monikers, including the Swan Nebula, the Horseshoe Nebula and the Lobster Nebula. It is also officially catalogued as Messier 17 (M17) and NGC 6618. The Omega nebula's colorful center is packed full of gas and dark dust — the raw ingredients from which new stars are born. The portion of the nebula featured in the new image contains the Omega nebula's newest stars, which are blue-white and dazzlingly bright. These newborn stars are lighting up their surrounding cosmic landscape. Swirling throughout the nebula are ribbons of dust that appear to be silhouetted against the glowing gas. The red hues that color the clouds of hydrogen gas are illuminated by the intense ultraviolet rays emitted by hot young stars, ESO officials said in a statement. The image was taken using the Focal Reducer and Spectrograph instrument on one of the four main telescopes that make up the VLT. The impressive size of the telescope, plus the steady air when the observations were made, made this a particularly crisp image of the Omega nebula, ESO officials said.